I’ve eaten at Bishamon several times, mainly due to convenience’s sake. It isn’t the type of place I would actively mark down in my oh so packed schedule as a place to revisit on x date, if you know what I mean. It seems that they have also recently made changes to their menu. Previously, you could order mini salads, such as sashimi and avocado salad for about $4.80, which I thought was a good price. Coupled with their mini sized ramen portions, the amount of food just filled the gap. It now seems that their new menu has done away with the mini sized salads. The full-sized sashimi salad now costs about $8.50. 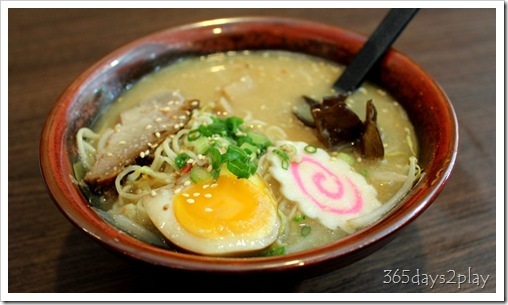 The mini ramen portions are still available at about $8. I think this is the perfect sized portion if you want to still be able to try their side dishes. Ordering ramen can be quite confusing if you don’t know the terminology. The pictures show similar looking bowls of noodles. A friend once told me how to unlock the mystery, which I will attempt to address here. It seems the main difference between all of them is in how the stock is prepared. There is chicken stock, pork stock and chicken and pork stock. For each of these, you can then continue to choose if you want a salt flavour (shio), soya sauce flavour (shoyu) or miso flavour (miso). These are the main choices but each restaurant may obviously try to impart their own uniqueness to the broth. You are on your own there. All I know is that I like the Tonkotsu stock with miso, which in my opinion gives the most impactful flavour. Miso sounds mild, especially when you associate it with the mild miso soup. For some reason, this is not so in the context of ramen broths. I ordered the Mini Sapporo Tonkotsu Ramen – $7.80. I think the broth is quite flavourful. 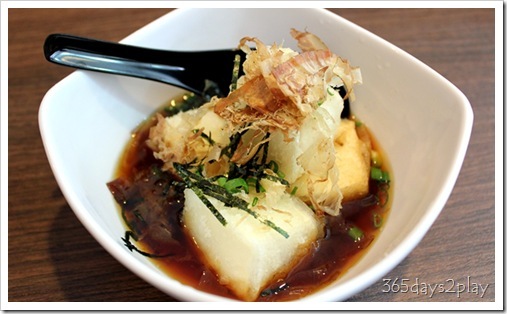 You can taste the flavours of the simmered ingredients in the broth. So many other places serve ramen broth that just tastes like salty water. The noodles are also bouncy, similar to the texture of wanton mee, which is exactly how I like it. Still, as mentioned previously, my favourite ramen restaurants are Marutama Ramen and Ippudo. 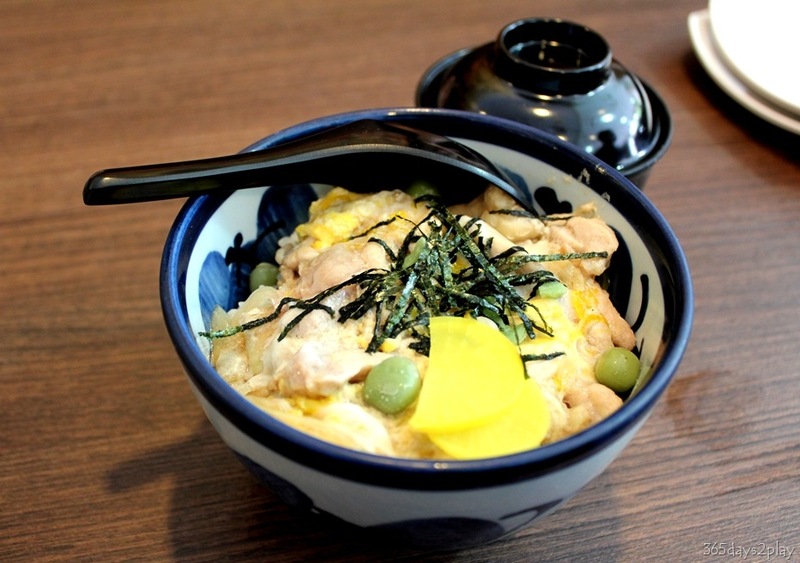 Bishamon also uses the chewy type of ramen for some of its other dishes, so if you don’t like those, be sure to order the Sapporo Tonkotsu Ramen, or ask the waiter if it is possible to get the bouncy noodles instead. Just went to Bishamon at Bedok Point today. I love the texture of the ramen. The stock was also flavorful. I tried the original miso ramen and the shio ramen. It is of the same standard or even better than some of the ramen I had in Hokkaido! 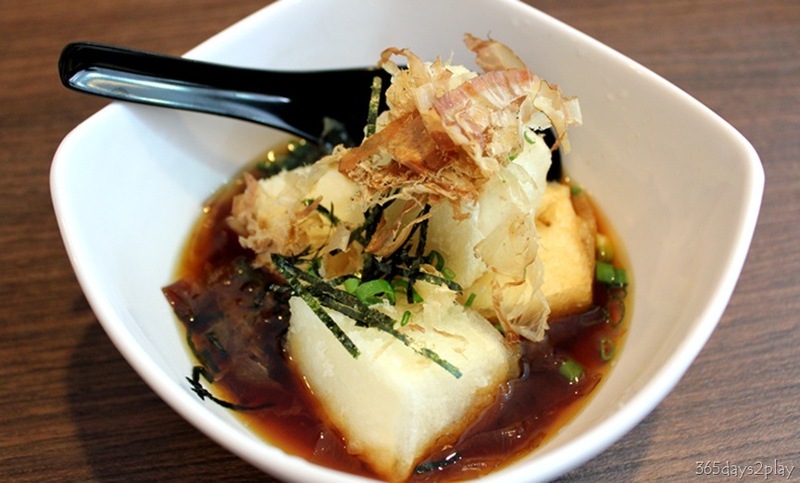 Great that the Bishamon at Bedok Point is so fantastic! I might try it out soon. I didn’t have that wonderful an experience when I tried Bishamon at Funan, although it was pretty nice. I prefer the Q Q type of ramen and I found Bishamon to be a bit chewy.